We are not happy for the offer charge when we check out because , when we book the room we already email and said about we make mistake when we book the room suppose to be for 2 person but we click it wrong , we make correction after that not too long after the booking but from accor group never response our email or request and when we check out today the staff ask to pay extra , at the beginning accor should let us know and hotel staff so rude when explain to us . This is our first stay with ibis and so disappointed . Another thing the staff with the uniform not nice , just remember hotel staff should be friendly not rude. Due to the fact that it was a business trip - I did not have too much opportunities to get deepen into the hotel atmosphere and services... - Surprised at arrival with Parking - but OK thanks to the possibility on the street. - not surprised with Breakfast - no vegan alternatives (I missed vegetable and options like margarine instead of butter, or hummus...) Fortunatelly I was equipped by myself. - Staff very nice and pleasant. Great location, good quality service and quirky room. Excellent. Nicely renovated old building fits ideally into the ancient city center of Colmar. Very friendly and hospitable staff. All the beauty of Colmar's ancient city center is just a five-minute walk away! We enjoyed ur short stay at this hotel. The bi-level family room was excellent value and comfortable for two adults and two children. The staff were very helpful, friendly and accommodating and spoke English. The breakfast buffet was also excellent in terms of choice and quality. There were a few small issues with the room cleanliness (we found a used toothpick) and the bath drain was hard to adjust, but nothing that really impacted on our stay. The location is brilliant, very close to the heart of the old town, and we wouldn’t hesitate to recommend this hotel to other families. Friendly staff, who were helpful and attentive. Excellent facilities, clean and comfortable rooms. Greta location for exploring this beautiful place. Great location, good breakfast, so so room in winter. Everything ok. The only strange thing I noticed, was the separate toilet, apart from the bad, that was not heated at all so it was frea*ing cold inside. Moreover there was no remote control for TV in the room. Other than that the hotel is fantastically located and serves a decent breakfast. It surely must be a very nice choice for the summer time. Excellent position in beautiful town of Colmar. Friendly & efficient check in, help with parking opposite hotel. Breakfast was very good & well stocked. Thoroughly enjoyable stay. We found the staff friendly and helpful. The room was comfortable and the facilities exactly as expected for this type of hotel. 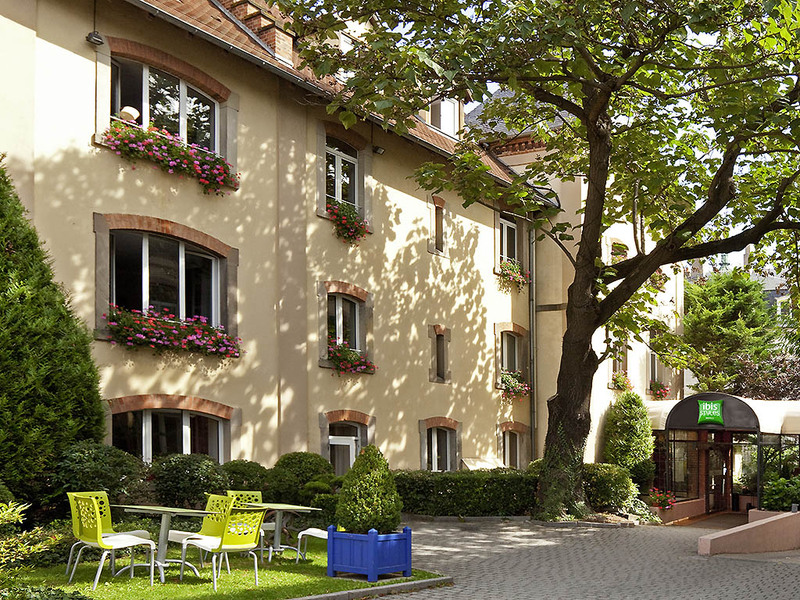 The location is also perfect for COLMAR town centre (just a few minutes walk away). Excellent Hotel in Colmar !!! - Location is very good and central so that we could walk easyly everywhere in Colmar. - Our room was clean , warm and big enough. - Hotel staff was very kind and acting friendly. - Breakfast buffet was very good with plenty of delicious foods. Perfect position for the Christmas markets, friendly, fluently English speaking staff, spacious rooms full of character, staff organised outside car park for us at the hotel, generous help-yourself hot drink/ snack bar, nice breakfast buffet. Appreciated the freshly squeezed orange juice and cook-yourself egg option. Only negative was the shower in one of our rooms which was tiny and flooded the floor. I enjoyed very much my stay at Ibis Styles Colmar - perfect location right next to the old town and just 10 minutes walk from the station. The room, though a bit small, was very clean and quiet. The breakfast buffet was very good. The staff was very friendly. What a place? Very nice room on ground floor with direct access from the garden. Very professional and kind reception with all practical hints for dinner in this beautiful town center. Also the bar in this former brewery is original. Complete breakfast service. We will bet back with some time to visit the town. A bit overpriced, rooms not very nice, some inexperienced staff. Some of the staff are a little inexperienced, they should be trained to effectively listen to a client's questions. Rooms are not very nice, too cramped and small. I know it is an Ibis and not a Mercure or Sofitel, but the toilet paper for example is a joke. Stylish modern hotel feel cosy. Hotel location is between train station and old town . There are park in front of hotel . My favorite breaskfast is fresh orange juice. The staff provides me a professional service, allowing me to gain time with respect to my client.